This service of remembrance would be meaningful for someone who liked the outdoors, adventure, or hiking. The person used in this one is purely fictional. Facilitator acts as a leader to the group Narrator follows behind the group helping anyone who needs it and reads the facts of Adam’s life. Friends, we have gathered here to remember and celebrate the life of Adam Evers. We share our gratitude for his life and our grief over his passing. As we search for the treasure he left for us may we find comfort and healing. In the bag, you were given, is a treasure map and a compass. We will be following the map to stopping places where we will tell the stories of some of the times we spent with Adam. The trail has marked spots for us to think about Adam’s arrival in the world, childhood, early adulthood, professional life, personal life and his last days. At each spot we will pause in silent reflection for a few moments and then you will be invited to share your thoughts and memories. Consulting the map and his compass, the facilitator speaks: Let us begin our treasure hunt by heading due north! Feel free to talk or sing as we make our way. At the first stop, the narrator states the facts of Adam’s birth: Adam Evers was born on April 12, 1943 in Clearsky, Montana to John and Pearl (Owns) Evers. Adam joined brothers Robert and Scott on the family farm six miles west of Clearsky. Facilitator: Let us honor this event with a few moments of silence. (Silence) I understand there is a family legend surrounding Adam’s birth. Would someone share the story? (Story) Are there other memories or stories of that time? (When the sharing is finished, the facilitator consults the map and looks to the compass.) Let us follow this path turning southeast toward his childhood. Maybe we will find the treasure Adam left us at the next stop. At the second stop, the narrator continues the facts of Adam’s life: Adam Evers attended elementary and high school at Clearsky Community Schools. While in school Adam excelled in science and math, participated in track running long distance and relay races, and played the saxophone in the band. Adam, also, spent 10 years in Boy Scouts during which he earned his Eagle Scout Badge. Facilitator: Let us honor this time in Adam’s life with a few moments of silence. (Silence) Did anyone share these years with Adam? (Allow people to raise their hands) Are there any memories you would like to share? After a few minutes of sharing, the facilitator continues: Obviously Adam’s childhood was filled with fun, learning and friends. (Consulting his map and the compass) Let us continue to follow the path to see where those years lead Adam. At the next stop, the narrator continues the facts of Adam’s life: Adam Evers graduated from the University of Montana with a degree in engineering. After college he took a job at Pierson Incorporated. After several years he took a position with Free Railroad and for the next 25 years, Adam was busy moving up in the organization. At the time of his retirement he was managing the engineering division of the Northwestern Region. Facilitator: Let us honor Adam’s professional life in silence. (Silence) Who worked with Adam? (Allow time for people to respond) Are there stories you would like to share? After a few minutes of sharing, the facilitator continues: It sounds like there are a lot more work memories we could share. Adam was committed to his work and his employees. It is time to move on to our path through Adams life. (Consulting his map and compass) Let us move west from here. At the next stop the narrator continues the facts of Adam’s life: Adam Evers married Jan St. James on February 23, 1964. They settled in Big City, Montana. The couple became parents to Jesse in 1965; Carly in 1967; and twins Quincy and Forest in 1970. The family spent time together fishing, hiking, rock climbing, and camping. They shared time with friends cooking out, attending ball games and other activities the children were involved in. Adam and Jan took great delight in nurturing their children to adulthood and enjoyed the company of extended family and friends. Facilitator: Let us honor Adam’s personal life in silence. (Silence) On behalf of the family, Quincy will be sharing some family reflections. (Quincy speaks) For Adam, his family and friends were the center of his life. His love and devotions were apparent every day of his life. (Consulting his map and compass) We will now move on to our final section of our journey of remembrance. Let us go once again in search of the treasure of Adam Evers. At the final stop, the narrator begins: Adam Evers honored this world with his presences for 68 years, 1 month and thirteen days. He died on May 23, 2011. He is survived by his wife Jan, his four children, eight grandchildren, two sisters and one uncle. Facilitator: Adam shared many of his 68 years with the people gathered here today. Over the years we have worked and played; laughed and argued; ate and drank; planned and schemed; celebrated and grieved with Adam. He was an important person in our lives. Over the last few days the memories of moments and events we shared have been playing in our mind. Those moments and events are nuggets of the life Adam Evers. Each in our own way loved and do love Adam. May we treasure the moments and the love for they are the treasure of Adam Evers. As you move to the pavilion to continue our celebration of Adam’s life, please take a picture from the basket as a memento, a reminder of the treasure Adam Evers left us. Let us gather at the pavilion to continue our celebration. 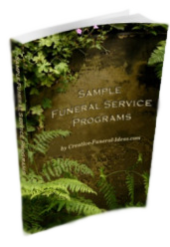 This service can be nicely done with a few inexpensive props. 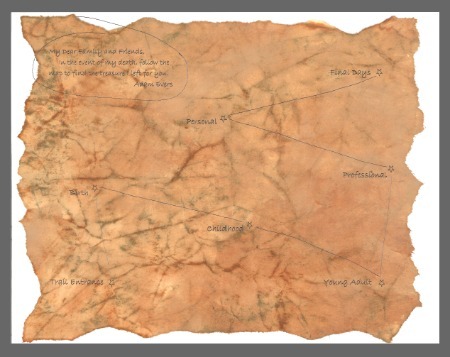 The treasure map can easily be created. In this case handwriting the map and its message adds character. Once it is written it can be photo copied on to paper all ready printed with an old tattered paper background. If desired, the other side of the map may be printed with biographical information, a comforting or inspiring quote, or other information. If both sides of the paper are going to be printed, it is best to use a heavier weight paper (24 pound or heavier) to prevent the ink from bleeding through the paper. Taking some time to set up the trail will enhance the celebration. Envision the trail stops outfitted with a few items of the deceased symbolic of that time or period of his life (baby shoes, track medals, wedding bulletin, retirement watch, and etc.) and a picture of him at that time. These might be displayed on old wooden crates, hung from trees, or arranged on rock formations, tree stumps or logs. The people gathered will feel welcomed and part of the community by additional touches. Attendees are given a burlap gift bags reminiscent of bags carried during the gold rush, rustic treasure map, and a compass. At the end of the trail the people are given a wallet sized picture. They maybe plain or printed with; “treasure the memory” or some other appropriate wording. As the gathered move to the pavilion or other gathering area they will connect with each other and continue the sharing of memories, grief, and healing. For some reason this is always easier when there is food and drink to share. The celebration food might be as simple as trail mix and bottled water (could be done with an added label made in honor of the deceased) or as complex as a pig roast. For a whole different feel, the celebration can be done with an air of elegance. The trail stops can be done with small tables covered in white table clothes. The gift bags made of white satin contain the compass and an embossed itinerary. The celebration food could be a catered affair with fruit bouquet center pieces on white cloth covered tables. Champaign bottles and glasses open the door for farewell toasts. Whichever direction the celebration is developed there are a few helpful hints. As it is being planned, keep in mind the people likely to attend. If there are people with physical challenges, try to visualize their needs. A few chairs at each stop would allow rest for those who have the need. Wheelchairs can be rented if needed. If alcohol is part of the celebration, offer non-alcoholic alternatives like sparkling juice. 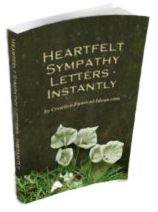 Although it is impossible to anticipate every need of people gather, a little forethought will help make the celebration inclusive of all the people who loved the deceased. If you are unable to find the gift bags and compasses locally, both are readily available on-line. Simply put a description of the item, like “burlap gift bags” or “mini compasses” into any of the major search engines and a number of shopping options will appear. The gift bags, even the burlap ones, can be found on some wedding supply sites. The mini compasses come with many quality and quantity options. Both the bags and the compasses come in multipacks which reduce the cost significantly. 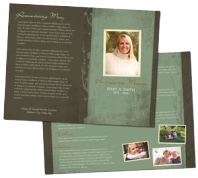 Wallet-sized photos are available at most stores with photo printing services. Some offer machines which will scan, edit, add a caption, and print the photos with just a few minutes of work. The rates are reasonable. It is also possible to generate the photos from a home computer and printer system, although the quality generally is not as good as professionally produced prints. Given the cost of ink and photo paper, it may actually be cheaper to use professionally produced photos. As plans for the gathering are being made, it is important to remember clean up. Everyone is likely to be tired by the time the gathering is over. It can be overwhelming if only a couple of people remain to put things in order especially when those people are often the ones who have worked hard to bring it together. Enlisting the help of family and friends, not worn out from planning and setting up, is as easy as making a few phone calls. Many people will be happy to have something they can do to help.